Thank you! | Be Nice. When I graduated high school, I decided to use this great stationary I had and write “thank you” notes to some of my teachers. I didn’t write one to every teacher I had–though they all deserved thanks–I wrote to those teachers who played an important role for me personally as I developed through school. I wrote one to my junior high English teacher who was the first to really believe in my independent voice; to my 5th grade teacher who gave me a book for Christmas that was one of my favorites (I still have it! ); to my TAG teacher (enrichment class), who showed me that intelligence was a gift and who introduced me to the idea of higher education; to my physics teacher, who engaged in philosophical debates with me regularly and let me keep my physics text book (still have it, too I think! ); one to my second grade teacher, who had this giant Garfield tent that we could read in if we behaved; and more. This week I was reminded of the value of a heartfelt “thank you.” I received one of the most delightful, lovely, and thoughtful thank you’s I’ve ever had! The wonderful Ms. Anita and her fabulous 7th graders from Brooklyn compiled a little stack of colorful notes, drawings, and a homemade scarf (!) and mailed them to me as a “thank you” for posting their work on this blog! (If you need a reminder, search the category “Brooklyn students embroideries” and you’ll find over 20 posts on the topic!) As I opened the package, all these bright paper hearts came falling out, and I read every message out-loud to my husband as I giggled, and smiled, and laughed! Each message was so sweet–and the drawings on them were terrific! 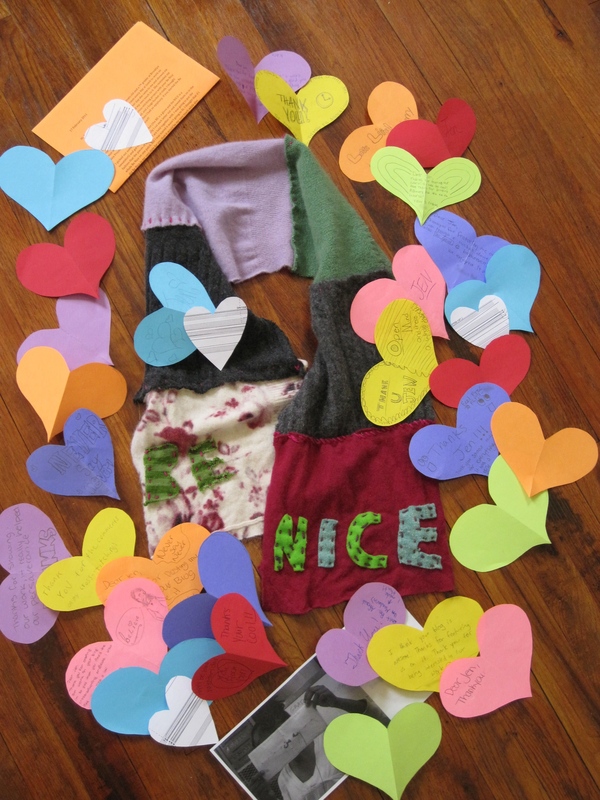 One of the students, Lucara, added the “Be Nice” to the scarf–it is perfect! One of my most prized possessions (and how did they know how much I love scarves!?)! The sheer joy I felt receiving such a thoughtful message of gratitude made me think of an article I had seen on CBS awhile back, about writing “thank you’s.” As the commentator mentioned, thank you notes are on their way out–specifically the hand-written kind. But some of us still do it, and some of us write them all the time. Take author John Kralik. Being grateful is linked to a number of amiable characteristics: patience, awareness, humility, value of community, receptivity, positivity, and so on. I imagine people sensed a transformation, or a certain openness, in Mr. Kralik’s character as he began to change his perspective, and responded in kind. And while sometimes a verbal “thank you” might not yield the same response, I believe any form of gratitude is an awesome sentiment to express regularly. These Brooklyn kids, their teacher, and John Kralik could all be wonderful role models as we begin to recognize the good things in our lives day to day. So, I’ll start now by saying: Thank you! For reading the blog, supporting the project, for being a kind person. It means the world to me. You can watch the CBS article here or read it here. Check out more of the book “365 Thank You’s: The Year a Simple Act of Daily Gratitude Changed My Life” by John Kralik here. This entry was posted in Be Nice. Challenges, Brooklyn students embroideries, Nice Reading Material, Perspectives on Be Nice., What "Be Nice" is all about, With Others and tagged 365 Thank Yous, Be Nice, Brooklyn, gratitude, John Kralik, thank you notes by Jen. Bookmark the permalink. This is my favorite post of all! I do think a sense of gratitude can change one’s life. An appreciative gesture can also have a huge effect on someone. What a coincidence that they made you a scarf and you love scarves! I love it when that happens! Jennifer, you continue to live–and express–a positive attitude. I was one of those teachers you thanked at your graduation time. Now I’m thanking you for being one of those students who made my job so rewarding.